Springboard Retail Connect is software that runs locally on your PC or Mac. Note that it does not run on an iPad. 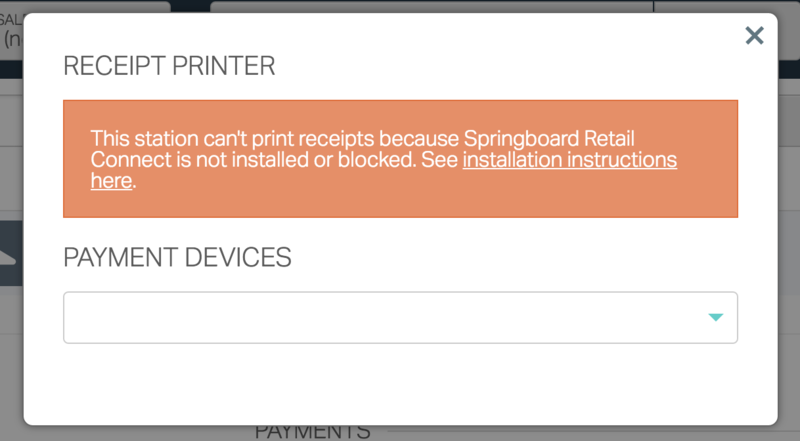 Springboard Retail controls hardware interaction with Springboard Retail, including receipt printers, label printers and certain credit card processing devices. The Clover Mini does not require Springboard Retail Connect. Haven't installed Connect yet? You can get it here. However, it's also possible that you might see this message even after installing Connect. In that case, follow the troubleshooting steps below. Is Springboard Retail Connect Running? If you don't see this icon, it means that Connect is not running. You can relaunch Connect by clicking the Start button and opening Springboard Retail Connect from the Programs menu. Is antivirus software blocking Connect (Windows)? If you are running Springboard Retail Connect on Windows, it's possible that your antivirus software is blocking access to Connect. If you're on an iPad, Springboard Retail Connect is not for you. You'll need our app instead. After following these steps, if you are still unable to use Springboard Retail Connect, it may need to be reinstalled completely. You can also contact us at any time if you need help.